Space Shuttle Atlantis being moved from the Orbiter Processing Facility to the VAB in this file photo from Oct. 17, before being transported in November to the Kennedy Space Center Visitor Complex. About 30 astronauts will lead the space shuttle Atlantis on the homestretch of its 9.8-mile journey Friday to its new home at the Kennedy Space Center Visitor Complex. About 30 astronauts will lead the space shuttle Atlantis on the homestretch of its 9.8-mile journey Friday to its new home at the Kennedy Space Center Visitor Complex. Tim Macy, director of project development and construction for Delaware North Companies Parks & Resorts, which operates the Visitor Complex, said the astronaut appearance was just added to Friday’s event schedule. Final preparations are under way for the daylong trip to the Visitor Complex from KSC Vehicle Assembly Building. Atlantis’ journey aboard a 76-wheeled Orbiter Transporter System vehicle will start at 6:30 a.m. and end at 6 p.m., with several planned stops along the way, including at Space Florida’s Exploration Park. More than 300 people are helping coordinate the move. The public will be able to buy tickets to view part of the journey and see Atlantis up close that day. Macy said he expects the final 150 yards of the trip to be the most challenging, as the massive orbiter must be make a right turn from State Road 405/NASA Parkway into the Visitor Complex area. It then will be maneuvered into its new building with only about 2 feet of clearance available on either side of its wings, then must be put in place within six to eight inches of its final mark. It later will be adjusted to within about 1.5 inches of the designated spot. The Atlantis exhibit building and exhibits are still under construction, with the attraction scheduled to open in July. The Oct. 17 move of the space shuttle Atlantis from the Orbiter Processing Facility to the Vehicle Assembly Building gave employees at NASA's Kennedy Space Center in Florida an opportunity to celebrate. The milestone completed preparations for display at Kennedy's visitor complex. Atlantis will remain in the VAB on display until it is transported to its final home at Kennedy's visitor complex early next month. 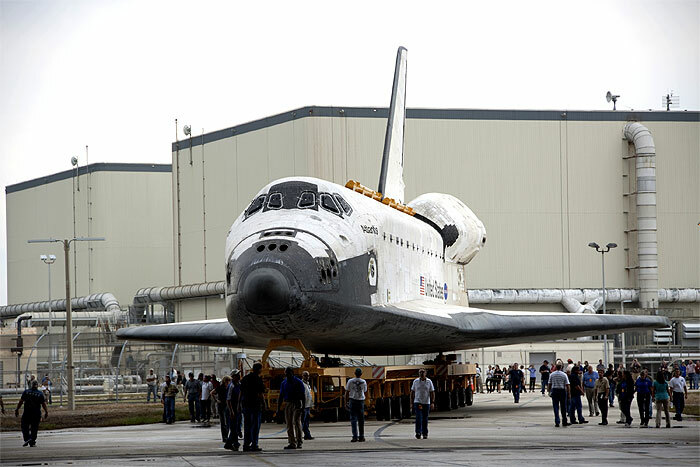 During the move, Atlantis stopped on the towway for a photo opportunity. For several hours there was a constant crowd of Kennedy employees who brought cameras to take pictures with the shuttle prior to its move to the visitor complex, slated for early November. Adding to the festive nature, representatives from the NASA Exchange were on hand with ice cream and other refreshments. Buddy McKenzie, the USA manager for Atlantis' forward and midbody looks forward to seeing the shuttle on display in the new museum. "If seeing Atlantis on display inspires even one young child, then it's all worth it," McKenzie said. "It's not the end -- I think of it as a beginning." 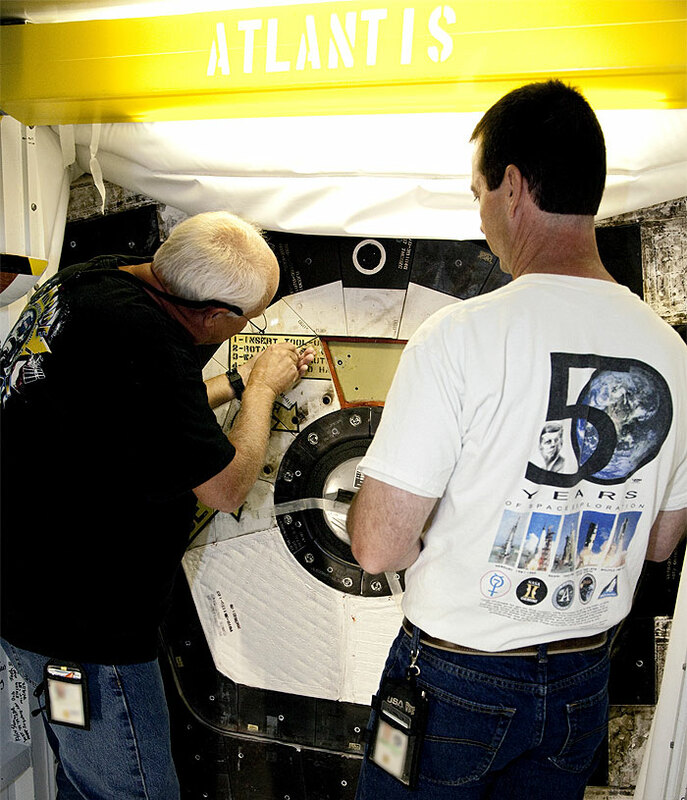 Preparations for the move to Atlantis' new home included closing of the crew hatch on Atlantis on Oct. 11. As he did with the final hatch closure on Endeavour, Bob Cabana, director of NASA's Kennedy Space Center and a former space shuttle commander, lent a hand in bay 2 of the Orbiter Processing Facility as United Space Alliance, or USA, technicians Danny Brown and Dave Chodkowski performed the task. Cabana turned the special T-shaped tool, which is much like a key, to lock the hatch in place. Through this crew hatch, 207 astronauts passed to enter Atlantis and take their seats for launch on 33 space shuttle missions. "The team preparing Atlantis for display has used the same pride and integrity they had as Atlantis was readied for each flight," said Bart Pannullo, NASA's Transition and Retirement vehicle manager. "Atlantis is the last space shuttle at Kennedy, the last vehicle to fly," said McKenzie who helped direct the hatch closing. "It's fitting that as the caretakers, we deliver it to the Kennedy Space Center Visitor Complex." The move to the museum being built especially for the historic spacecraft is scheduled for Nov. 2. Cabana was looking even further ahead. "The good side of this is that Atlantis, Discovery and Endeavour will be able to tell the space shuttle story to millions for years to come," he said. The last shuttle to fly in space is just hours away from heading on its new mission of education. 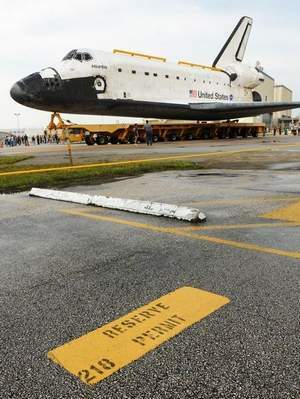 Atlantis will be moved all day Friday on a nearly 10-mile road journey to the Kennedy Space Center Visitor Complex. It will be the last time anyone will see a 150,000-plus pound space shuttle in motion. “You're right, there are a lot of logistics to it,” said project manager Tim Macy. Macy is in charge of getting the Kennedy Space Center Visitor Complex's newest guest safely there. The shuttle will go 9.8 miles from the Vehicle Assembly Building to a new $100 million exhibit, currently under construction. “We are lucky in that we don't have to go through city streets, we don't have all the same issues Endeavour had,” said Macy. Shuttle Endeavour had to be moved through the streets of Los Angeles to the California Science Center. It meant moving hundreds of trees, power poles and a lot more. Here, 70 percent of Atlantis' trip is on KSC restricted property, but even in the open space, 120 light poles, 23 traffic signals, 56 traffic signs and one high voltage line have been removed and will be replaced. The route begins at the Vehicle Assembly Building, goes down Kennedy Parkway, then on to SR 405 NASA Parkway and the KSC Headquarters Building, where a ceremony will take place. After that, the shuttle will go along Avenue C, and then stop for four hours at Exploration Park for visitor complex patrons to see. The route then moves to Space Commerce Way, back to SR 405 for its turn into the attraction. “When it really comes down to it, the last 150 yards are the toughest. Sharp right hand turn, get the orbiter into position, and into its final resting place,” said Macy. The entire journey with stops is expected to take eleven hours. The Atlantis exhibit is due to open in July of 2013.